First came Spotify, then Netflix. Now, HTC is betting that the time is right for virtual reality (VR) to join the subscription bandwagon. 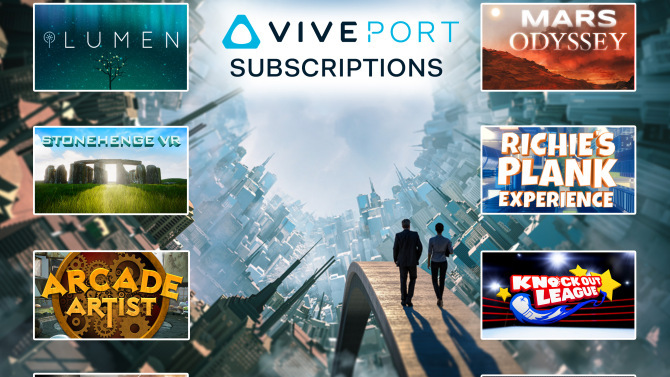 HTC’s Viveport VR subscription service officially opened its doors for developers this week, allowing them to register their games and VR experiences and be part of the service’s launch later this spring. HTC first announced its plans to launch a subscription service for its HTC Vive VR headset at CES earlier this year. Since then, more than 14,000 consumers have signed up to be notified about the service, said Viveport President Rikard Steiber in an interview with Variety this week. The company has yet to reveal the final ricing, but Steiber said it will be similar to what Netflix and Spotify are charging consumers for their subscription services. He also revealed some other key details about the upcoming service: HTC will launch the subscription service some time in the coming weeks, and Steiber said that new as well as existing Vive headset owners will get a month of free access. For their monthly fee, consumers will be able to download a limited number of games and experiences at a time to their PC to use with their HTC Vive headset — Steiber said “a handful” will be available to use at the same time. Users can then opt to “trade in” one of these games or experiences to download and use a new one. Steiber argued that subscriptions aren’t just a proven business model, but also a good way to get more exposure for VR games and experiences that may otherwise get lost among the more than 1000 titles already available for sale for the Vive headset. “We see it as a very important promotional tool,” he said. He mused that some developers may decide to put their titles on the subscription service first to gain exposure before deciding to sell them. Others may use more traditional windowing, and sell individual downloads before eventually moving titles to the subscription service. The company is taking a 40 percent cut of the subscription revenue, while developers get 60 percent, he explained. The company wants to use next week’s Game Developer Conference in San Francisco to woo developers and publishers, and have plenty of them sign up ahead of an official consumer launch of the subscription service in the coming weeks. “We are trying to create some urgency,” said Steiber.